Dawn of the planet of the apes Review: Town and Country? This is a Korean in America. I'm writing this sitting in a bakery/ deli near the 57 street, Manhattan. I just had a pretty good chocolate éclair. So, I plotted my behind on the chair and started to write on my tablet like a hipster albiet neither that well dressed or young. The first thing I started to write is the review of the new planet of the apes movie. I do not have the deep relationship with this franchise. I barely remember seeing some of the old movies on TV when I was a wee youngster. The real relationship I had with the franchise started with the Tim Burton movie. Less said about that movie the better. However, it is nowhere near a bad movie. It is good. This sequel is not the same story as its predecessor as many sequals are. Rather, it is a different type of story using some of the same characters, mostly the apes, and the world of the previous movie. The previous movie is a " Spartacus / slavery" story. You have an ape who is basically a "house slave" noticing that he is a slave after all. How this ape deals with this situation is the core of the movie's story. While the story was nothing new, having it transposed on to apes and the performances of the main ape carried the movie. It made it fresh again. The new movie is a basic story of when peoples from the tribe living outside and so called civilized town within a wall collide. It is just that the tribe is now a tribe of apes. With this kind of story, you have two sides the differ significantly and comes to blow because of this differences usually triggered by a conflict over resources such as water. In this movie, it is over power. I mean the electric kind. In this movie, you have the human world devastated by a plague and only a rag tag few left living in walled smaller cities. On the other side, you have tribe of smart apes who have created their own world. When I say smart, I am basically saying that they are same as humans albeit not with the accumulated knowledge of mankind. So in this new movie, you can equate apes to any barbarian tribe or American Indian tribe of the past. This in a way is rather disappointing as a lot of the ape characteristics have disappeared. The story in the movie does feel awfully familiar albeit decently executed. It is like a spec script some one had lying around was adapted for this movie. Knowing how Hollywood works, I will not be surprised if this was actually the case. 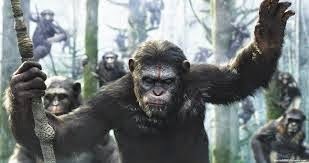 However, as with the previous movie, having apes as the main characters of the movie do help considerably to make the movie feel fresh. It reminds me of an old movie "Enemy minds" which was a basic two enemies stranded together story but with an alien as one part of the duo. And this made it made it better. While the adaption of the story itself is pretty well done, the more serious problem Is that the script itself is not that great although not terrible by Hollywood standards. The plot is overly compressed in both time and complexity. The whole thing with the apes is that the introduction or rather reintroduction of the humans into their society destroys the balance of their primitive social dynamic. The script basically covers this in about a week in real time and the development of the story on the part of the apes is far too rushed. And considering how the apes are portrayed in the movie, you cannot use the excuse that this is because they are apes. Another problem is that the script is weighted heavy towards to apes part. Once again, this is a "town and country" Story. Thus, there are two parts to the story which need to be balanced within the story. If it weights heavy towards, the story become a "barbarians at the gate" story. If it goes the other way, it becomes a "noble barbarians" story in the vein of "Conan the barbarian". In this movie, the human part of the story is very superficial Hollywood action movie story telling fair with bland and 2 dimensional characters. This seriously imbalances the story. In addition, this means that the story is not intellectual although not unintelligent. What I mean by this is that the problems that the characters encounter is nowhere near unpredictable if you have a college freshman level understanding of political science. When you introduce this type of unknown variables within a primitive social dynamic, these problems will happen. However, the human characters are oblivious to this. Usually, with this type of science fiction stories, a professor type of character is included to do the lifting in this area. In this script, they is no one to do this par. there are only well meaning high school drop out level common men and not well meaning idiots. The consequence of this imbalance and the compressed story is that the actual plot becomes rather stupid compared to the drama on the part of the apes. The fact that the movie has an ape riding a horse with machine guns in each arms does not actually help the situation. The reason to see this movie is the performance of the CGI apes and the depiction of ape society. Across the board, the drama surrounding how the apes deal with the reintroduction of humans into their lives are riveting. Some may say that it is enough to carry the whole movie. I do not totally agree. The movie feels uneven with the humans not carrying their own weight. The "Dawn of the planet of the apes" is at its core a drama about town versus country with the apes playing the part of the country. And this is the best part of the movie. The combination of great CGI and the performances of the motion capture actors elevate the movie considerably. However, the movie cannot hid the fact that it is unbalanced and not smart enough for what it is trying to do. The script is just a recycling of old stories and the inclusion of apes is not enough to put it on the level of the previous movie which had the benefit of being a more simply story. It was just about a single ape versus the world. This is the ape world versus the human world. I give this movie a B+. It is worth seeing although it is not a masterpiece. How many masterpieces will you actually see? The original Planet of the Apes with Charlton Heston is one of my favorite Sci-Fi movies. In thinking what you wrote about the humans not pulling their own weight. Humanity was a very low factor in that film, any surviving humans were treated as lobotomized slaves and hunted down in the fields like animals. A complete role reversal. Maybe this movie is trying to show that? Gone are the smart people, leaders, politicians, those that keep the human world going with their ideas and faulty leadership. Apes rule, humans drool. You're only left with the 'commoners.' That's just a 'deep' guess. It's probably as you say. Standard Hollywood fare. I liked the structure of the Ape world then. The Orangoutangs were the leaders, the chimpanzees made up the white and blue collar society, and the Gorillas were the military punks. I was hoping we see shades of the original film, with the apes starting to do their secret experiments on the humans like that. But it's too soon in their monkey development. How far along are they since the first movie? If Caesar is still alive, then it must be only a few years. (Comes back: I see it's 10 years.) The Astronaut Taylor is still in cold sleep far above the earth. That was a great nod in the first-showing a news broadcast of the ship take-off, the first ever of its kind. I enjoyed the first movie in THIS franchise. As much as I find the CGI very cool, I have a fondness for the rubber chimp masks. In its time it looked so real. (Okay, the mouths didn't move too well, but you know…) And nothing beats that iconic ending on the beach! I hope to see this one soon.